Highlander Merchandise favorites and new item wish list. 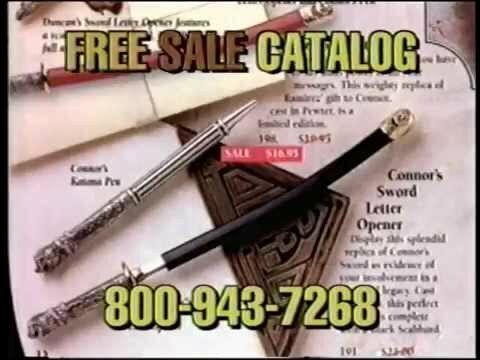 By now most have us have purchased a piece of Highlander merchandise. Which 5 items were your favorites? What 5 new items do you wish they had sold? I'd like to see more fairy stories about the police. The only Highlander items I have purchased are the movies, the TV series, and The Raven. But my TV series came with a Watchers Disk and a box of Highlander trading cards, most of which I have not opened. I'd like the versions of the Watcher Pendants. The old one from the first episode they appeared in, and the other one. Thanks for posting the commercial. They were very cheesy but memorable. Are you going to try and make a Le Blues Bar sign too? I ordered thd last two Flaming star rings of Amanda from the Official Highlander site before it close down. I wish I had ordered Duncan's sword back when it was available. I finally had to retire my purple tee shirt that was made in Canada. It got a few tears in it around the embroidered logo. I saved the logo to reuse in another project. The back of the shirt is now part of a pillow I made from a bandanna, some of my mom's quilting blocks and some lace my Gram crocheted. The pillow is decorative on one side and practical on the back. I love that I was able to remember my blood family and my Highlander family with the same project. What Highlander themed merchandise have you discovered or created yourself? I have created some photo collages using my own pictures of the actors and their character cards from the show as well as a spot for an autograph from the actor as gifts for friends. I have also made gift boxes that were covered with photos taken from the card game cards. I have so many spare cards that I have been using them in art projects. I would love to see pictures of your art projects, Colleengael! I have given each of them away already. When I finish my next project I will post a picture of it on my Facebook page and let everyone know. I have also bought several swords used by other Immies in the series. No true props, but same models or types, a few Marto ones which is what was used on the show the first three or so seasons. The right hand rack are all types used in the series by other immortals. Here is Amanda's Morning Star ring I mentioned in a comment above.